Standing 520 feet tall and having a distinctive dome shape that gives it its name, The Beehive is hard to miss as you're driving through Acadia National Park. 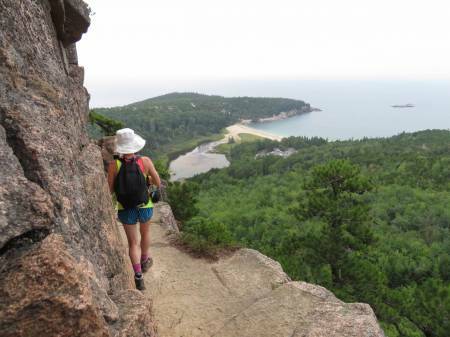 If you're up to the challenge, the trail to its peak offers a very strenuous hike and climb that rewards you with some of the most awe-inspiring views of the ocean and landscape that you'll find anywhere within the park. In many places, the trail is nearly vertical, and you have to use handrails to negotiate it. At the top, you'll have plenty of room to rest, have a picnic if you wish, and admire the view. This is a demanding hike. Be sure to bring water. And if you're afraid of heights, you may be very uneasy. Expect your adventure to last at least 2 hours. You might want to take one of the free shuttles to the trailhead, as parking is competitive. You may be able to park in the nearby lot for Sand Beach, or along the road.